More than ever this campaign is about location, location, location. Conceived for an anti acne product, instead of working with pictures of people with acne they produced posters with photos of nice models BUT the posters are stucked on rugged walls. 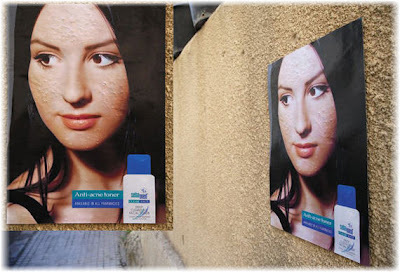 "The texture of the walls is imprinted on the posters and makes pretty faces look rather jagged: the effect of Acne", explains the Creative Director, Samer Younes. The Agency is Saatchi & Saatchi (Beirut) and the campaing got an Epica Bronze Award under the category Press, Poster & Techniques.